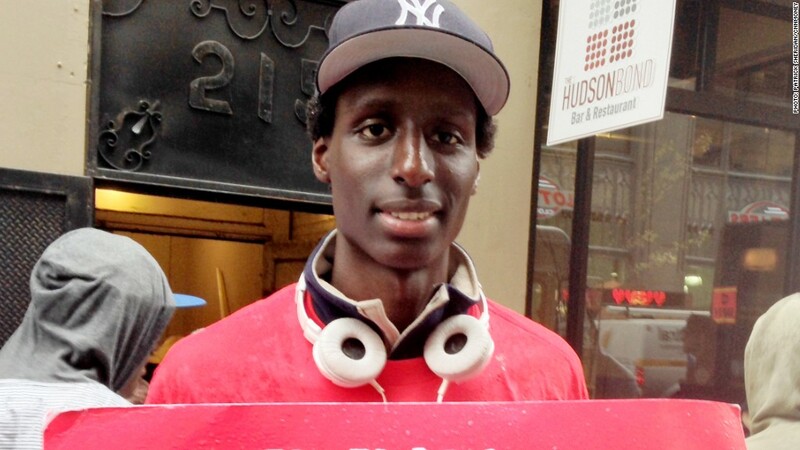 Chad Tall, Taco Bell, earns $8 an hour: "I support a sister, brother and my mom. We all live together in an apartment in the Bronx." Fast-food workers went on strike across the country on Thursday hitting pizza, burger and taco chains in Chicago, Los Angeles, Boston, Philadelphia, and other cities. Organizers say workers in about 150 cities walked off work to demand a minimum wage of $15 an hour, and the right to join unions without retaliation from employers. The big chains of the $200 billion fast food industry were well represented, with workers from McDonald's (MCD), Taco Bell (YUM), Chipotle (CMG), KFC, Wendy's (WEN), Burger King (BKW) and Domino's Pizza. In New York City, workers paraded up Broadway beating drums and blowing vuvuzelas. CNNMoney talked to several of them. Here they are, in their own voices. 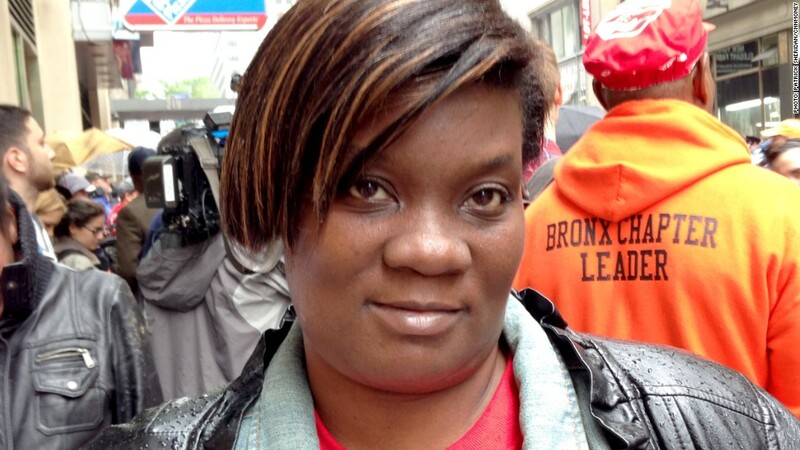 Sheila Brown, KFC, earns $8 an hour: "I am here for respect, equal rights for workers, and to be treated fairly." 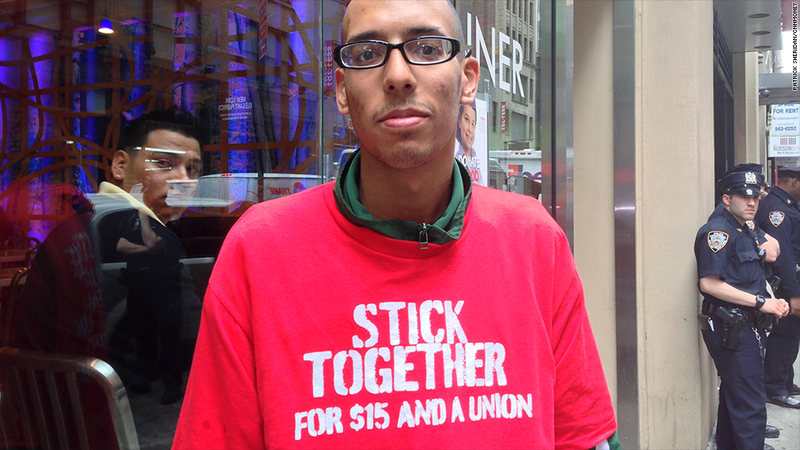 Anthony Roman, McDonald's, earns $8 an hour: "Everybody else in the store was afraid to strike. My boss does not rule my destiny." 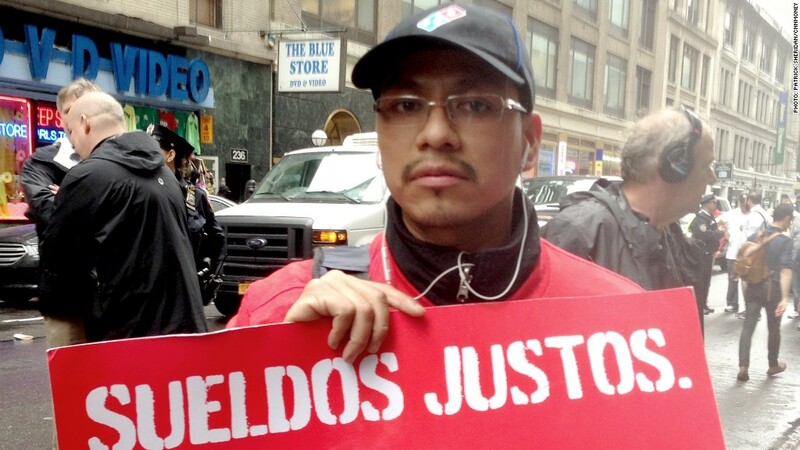 Prospero Sanchez, Domino's Pizza, earns $11.50 an hour: "I've worked 14 years at Domino's and I can't support a family. I have a 2-year-old daughter and a 3-month-old son." 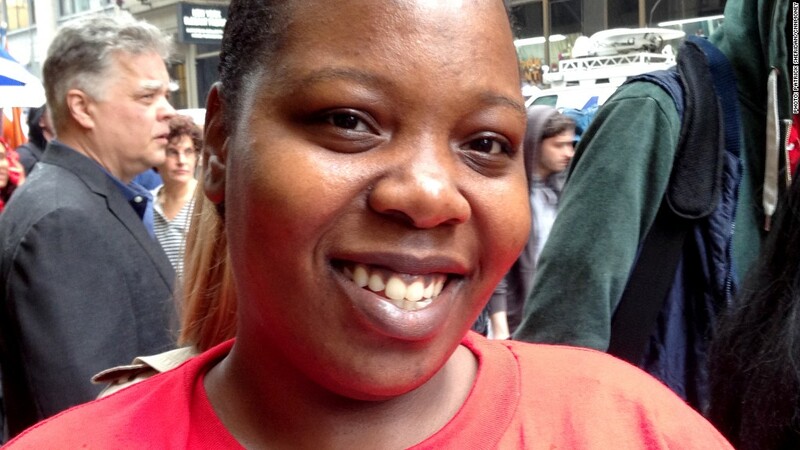 Sabrina Storey, KFC, earns $8 an hour: "I live in a homeless shelter, and I go to school. They want us to work hard but they don't want to pay for it." 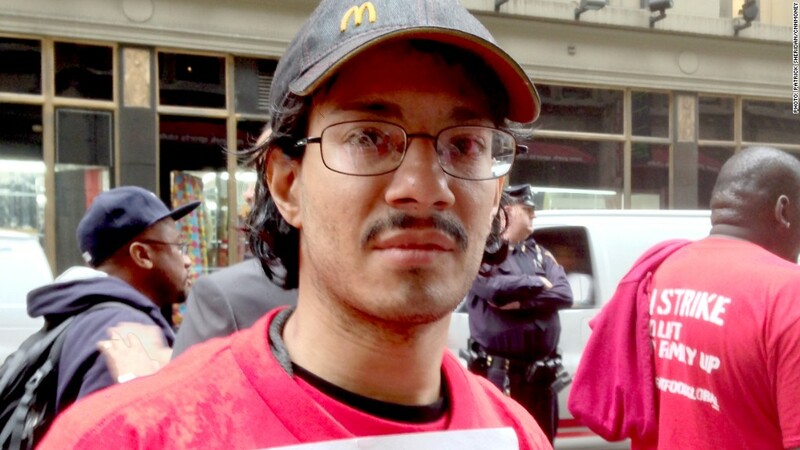 Alex Ortiz, Wendy's, earns $8 an hour: "I'm 24 and I live with my parents. They get food stamps and government assistance for rent. I want to go to college someday for computer science." 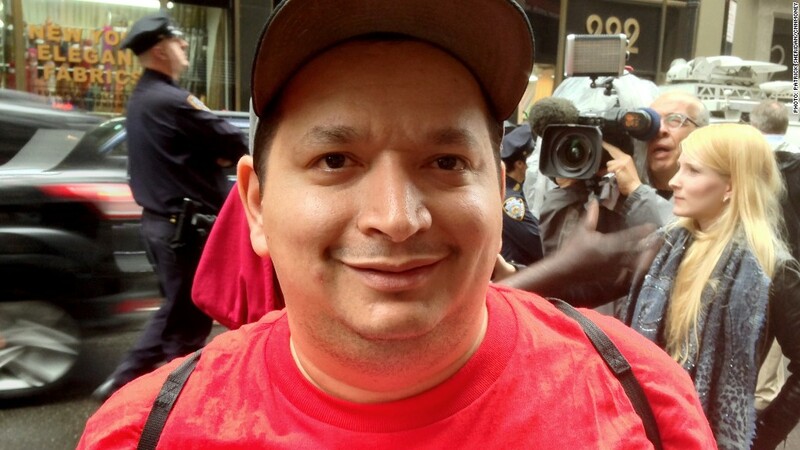 Luis Vasquez, Chipotle Mexican Grill, earns $9 an hour: "I'd like to go back to college, but I can't afford it." The May 15 protests also went global with rallies reported from Tokyo, Seoul and London.